Boulevard Heights is one of Atlanta's best kept secrets. Adjacent to Grant Park and East Atlanta and just south of Ormewood Park, Boulevard Heights, or BOHO, is a diverse and vibrant community of approximately 250 homes. BOHO is bounded by Confederate Ave. (and the future Atlanta Beltline) on the north, the State Facility to the east, Boulevard to the west and Intrenchment Creek to the south. The neighborhood is directly on the Atlanta Beltline, a network of public parks, multi-use trails and transit along a historic 22-mile railroad corridor circling downtown and connecting 45 neighborhoods directly to each other. The north border of the neighborhood contains the planned Beltline right of way. To the west, the neighborhood shares a border with Boulevard Crossing Park. The First Phase of the park, two sports fields, opened for use in the fall of 2011. We have an active neighborhood organization with regular planned activities such as neighborhood cleanups and cookouts, and a very active community garden which is maintained by several involved neighbors. BOHO is an extremely close knit community with very active crime watch, private security patrol (www.trolleypatrol.com), and a well-populated private email list (200+ members) that facilitates neighborhood communication (SEE INFORMATION BELOW -- "Boulevard Height Google Group"). We have a strong sense of neighborhood pride and concern; everybody knows everybody and they look out for one another. Google Group - We also have a "neighbors only" (by signing up for membership through a moderator) google groups discussion board. This is where you can ask questions, find neighborhood and community updates, learn about nearby restaurants and businesses (engage in lively debates over "favorites"), view and share public safety-related Be On The Lookout (or BOLO) notes, and find out about "breaking news" in this and surrounding communities. It is a moderated board but the opinions expressed in postings are those of the individual posters and are not endorsed by the neighborhood as a whole and do not officially represent the opinions of other individual residents or the neighborhood as a whole. Also please be aware that it can be high-volume at times so be sure to choose the appropriate notification/subscription settings to avoid having your email inbox flooded with many daily messages at times. It can be convenient to have new messages delivered to your chosen email inbox but you can opt to sign in at your convenience to view new messages on the web, too. 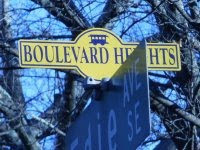 Learn about the Boulevard Heights Google Group or sign up. NOTE: You must create a Google profile/account or sign in to an existing Google profile/account to request membership to the BOHO Google Group.